It’s nine degrees outside in the cold rain which is now settling in on a grey Melbourne afternoon. And my tropical-acclimatised bones are not coping. The woman who opens the large heavy door of a 70’s townhouse, tucked away in a popular inner-city suburb, does not seem to be noticing the cold at all. The irony is that she is the one who grew up in tropical Indonesia .. but greets me wearing a short-sleeve, pattern-checked, pinafore dress. 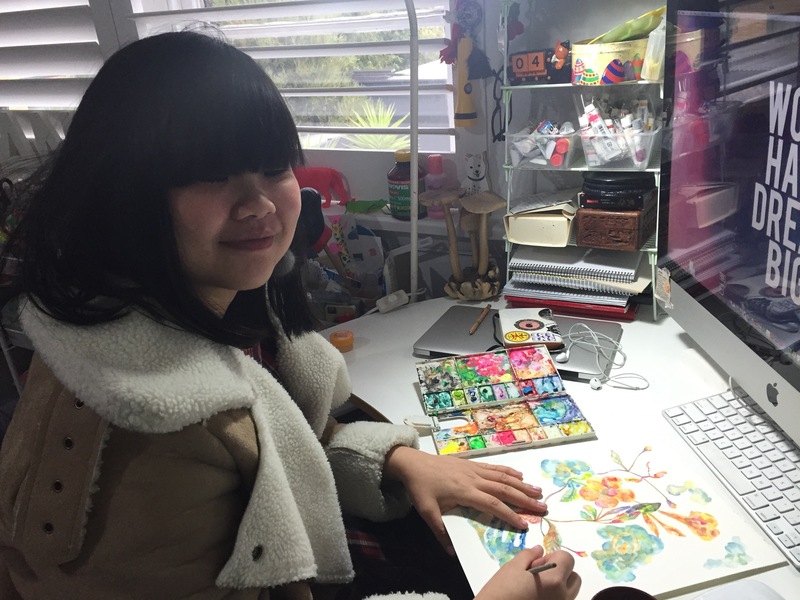 Indonesian born artist Nani Puspasari at her home studio in Windsor, Melbourne, Australia. Nani Puspasari gives a happy hello and directs me up the concrete flight of stairs. Small pretty handwritten signs are on the wall “Welcome to Heaven” and then further up “Welcome to Hell”. “That was for my birthday party” she says with a smile. And welcome to the world of Nani Puspasari. This illustrator, designer, photographer and artist was born on Indonesia’s resource rich island of Kalimantan. With the moniker of “designani”, she’s lived in Melbourne for 8 years established herself as a graphic artist, while on the sidelines mixing-up and experimenting with a range of mediums – pencil & painting, embroidery, collage, murals, installation. Her artistic desires could have taken her somewhere else instead of Australia. “I wanted to go to London but it’s too far, and I told my parents that I would not be returning to Indonesia once I had gone.” Of course no Indonesian family wants their children to be far away, so Singapore and Melbourne were suggested.. and Melbourne was it. Her eclectic style works well in this city. Working full time as a graphic artist, we enter the work-space she’s created in her home – part of her large bedroom – and it’s filled with artwork and artists’ tools and a very cute low round table and milk crates to sit on. And thankfully there are cushions! At University in Surabaya, where she says she was the “small-town kid” that didn’t quite fit in with the “upper class”; her on-the-ground sensibility from working in her parent’s business didn’t sit comfortably with the “brand-name” culture that she found herself in. Which is perhaps why she feels at home in Melbourne where, she says, society is less judgemental about the way people look and what they are doing. In Surabaya (a city on the east of Java island, becoming one of it’s largest and fastest growing) Nani Puspasari became friends with an artist, joined in a group exhibition, and her path began. Which saw her eventually travelling to Melbourne and completing two Masters, and becoming part of the arts community. She has just finished a commission for the design of this year’s Ubud Writers Festival, a popular annual event on the island of Bali. And has won silver for an illustrator award for a book cover (by Indonesian writer Lily Yulianti Farid) as well as work for Melbourne cafes, and dipping into her own personal projects .. such as “The Feminine World” using ink and thin yellow wool to create a story of the day, every day, about being a woman. She is quirky, and fun, and chatty and shy, but also open. And by this time has put on a large coat. She talks of the dark dream that she endured for seven years when young, which included finding her beating heart in a jar on a mountain of rubbish. Which is rather something to take in, In her room dotted with bright and dark artwork, and dominated by a frothy white bed propped up high. Sleeping, she says, gives her inspiration. As well as terrifying insights, it would seem. Nani Puspasari is following her path and finding her tempo; an Indonesian living in Australia.